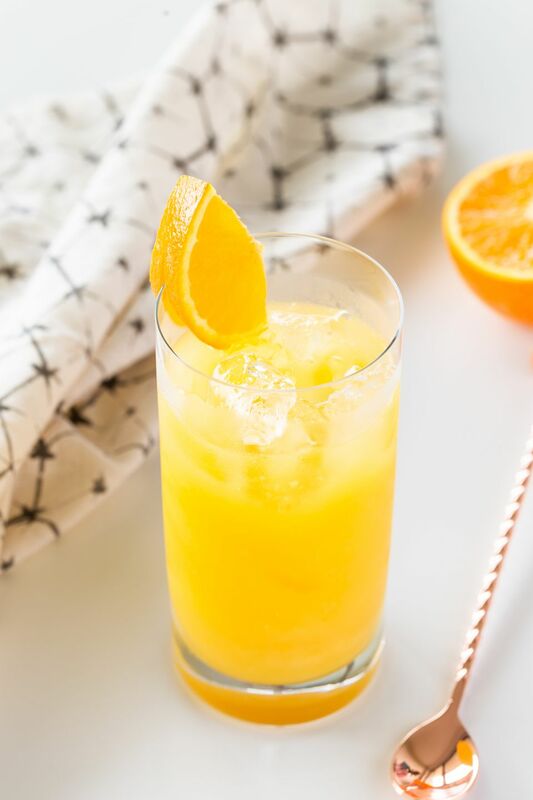 Few mixed drinks are as easy as the popular Screwdriver. It is not only an essential drink that everyone should know and one of the best brunch drinks, but it lends itself to experimentation and improvement. The Screwdriver is, quite simply, vodka and orange juice. There is no mystery or secret ingredients, and all you need to do is pour a shot of vodka and fill your glass with OJ. However, there are some little things that you can do that will improve your Screwdriver or add a spark to an otherwise ordinary drink. Build the ingredients in a collins glass with ice. The Vodka. This is not the place for your best vodka (though use it if you like), but it's also important not to be a complete cheapskate when it comes to the single liquor used in any drink. There are many great tasting vodkas that are also budget-friendly on the market today. Explore these options and find the best 'well' vodka for your bar and use it in drinks like this. The Orange Juice. If you want the best Screwdriver possible, you should use fresh-squeezed orange juice. It is very easy and takes just a few minutes to get enough fresh juice for the drink. If you are going to use a store-bought juice, look for the cleanest, most natural juice available. Flavored Vodka - It is the easiest way to add a little spark and flavor contrast. Citrus vodkas would be an obvious option, though something with a little more contrast and will add depth. Try one of the berry vodkas for starters. Either cucumber or vanilla vodkas are amazing here as well. Experiment with your own infusions; rosemary-strawberry vodka is a very fun base for a Screwdriver. Add a Sweetener - Orange juice has a natural acidity that can be combated with a little sweetener. To keep the flavor profile untouched, add a little simple syrup to your drink. If you want to add another flavor along with sweetness, take a hint from the Tequila Sunrise and add grenadine or a similar syrup like strawberry or raspberry-lavender. Just a small dollop of syrup will make a world of difference. Add Sparkle - Lighten up your Screwdriver by topping it off with soda. Ginger ale and club soda are two perfect options, though you may also want to consider something a bit more fun like DRY Cucumber or Q Ginger. Also, you can take inspiration from drinks like the Mimosa and add a little sparkling wine. Muddled Fruit - Before pouring your Screwdriver, muddle a few pieces of fresh fruit in your glass. Berries add a nice contrast and kiwi are an easy and fun addition. Lemon, lime, peach and almost any fruit you can find will add just a little bit of dimension to this simple drink.